The cure for ugly truckin'! Back in 2010, we took on a massive project, the likes of which we had never tried before – giving a truck a complete makeover! Up to that point, we’d installed a lot of chrome and lights on trucks, but never more than a day’s worth of work at a time. It’s not the type of project that’s in high demand – most of our drivers are on their way to a delivery, so they may have a spare couple of hours, but rarely days. This project was even more interesting because the owner of the truck would be in Israel the whole time. Mr. Valency Shmuel had been a customer of ours for a long time, but we’d always shipped parts overseas to him before. Now, he was buying a new, 2011 Kenworth W900L (a truck with little or no presence in that part of the world) and having it brought halfway around the world to him! The truck was manufactured in Washington state and driven to us in West Memphis, AR. A long drive, sure, but nothing compared to the trip it would later make by water to Israel. After months of pre-arrival planning and coordination, we started several weeks of work on the truck. Meanwhile, our installation shop stayed open and available to our regular customers. It was a colossal project, but through teamwork and patience, we got it done! Earlier this year, Mr. Valency and Michael started working on plans for a second truck – this time, a 2014 Kenworth W900L. Again, they spent months choosing parts and coordinating the entire process. They even managed to work in the same amount of glamour on a smaller budget! We’re very proud of how this truck turned out. It’s extremely cool to be involved in a big international project like this one. 2″ round “Stealth” chrome plastic screwless grommet cover – no visor – screwless light bezels! These are definitely an Empire Chrome favorite. We install a lot of chrome on a lot of trucks, and we’ve been lucky enough over the years to build relationships with a large number of drivers who keep coming back for more. One example is Mary H., a no-nonsense gal who’s always looking for something different to set her truck apart from the rest. She’s always challenging our guys to come up with new parts or new ways to install old ones, and it certainly pays off. This Cascadia has a lot of stainless steel accents, without looking gaudy or overdone. One of the first things we tried out on Mary’s truck was to change the stock visor lights to something much prettier – like these Flatline LEDs, which look almost like solid chrome when they’re off. This photo isn’t just an excuse to show off her adorable dog – these “Chopped Look” style ventshades were the result of several attempts to get them just right. No manufacturer had prototyped a chopped look shade for Cascadias yet, and Mary wanted a set. After running into a fellow Cascadia driver who had rigged a set of Kenworth ventshades to fit his truck, Mary brought us a challenge. She was patient enough to let us work with one of our manufacturers to get a set made to fit. Her persistence certainly paid off! Here’s a feature you don’t see on many Cascadias at all – a stainless steel cab and sleeper light kit, complete with Flatline LEDs to match the ones we had put in her visor previously. I was browsing through Flickr when I ran across these super-sweet photos of a tricked-out Western Star Heritage from Down Under! This truck is proof that with a little ingenuity, and a dedication to the time and effort it takes, you can make any truck look good. It doesn’t have to be a Peterbilt, no matter what other drivers may tell you!! 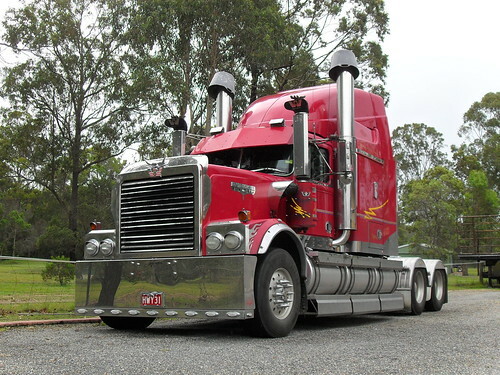 For more cool trucks from down under, definitely check out BennyT908’s photostream. 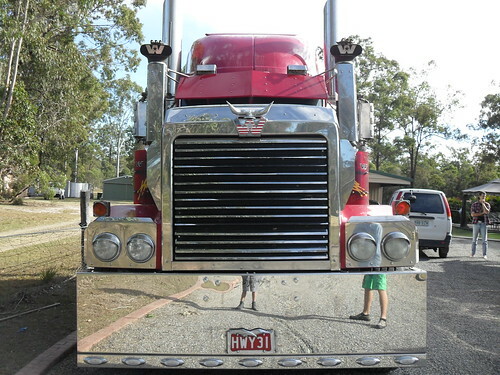 He has a ton of great images of chromed-up trucks. I’ve always liked the caps on top of the air cleaners on Australian trucks. A lot of Americans say “yuck,” but I’m a big supporter of anything unique! Check out those half-moon fenders. And the stainless fairings along the tanks are pretty neat, as well. Notice that there are THREE fuel tanks on this side. Aussie trucks have to go longer distances between refueling than most American trucks. I bet their diesel pumps go up to five figures. MMMHMMM!! Louvered grill, boxed end bumper, and a slick bugshield. Looking SO good! Even the interior looks awesome. Check out that custom shifter shaft! He’s got a bull horn hood ornament for a gear shift knob! I’m not sure how that even works, but man, that’s just too cool. 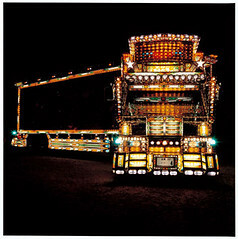 I was so amazed by our last feature on Japanese Dekotora trucks that I decided to do it again. I can’t get over how much stuff these guys have put on their trucks! They look like rolling casinos. Hey – half of them are on boats, maybe casino buses will be the next big thing? For even more dekotora pictures, check out this Flickr stream. 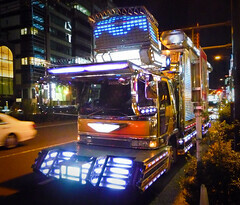 Dekotora, a Japanese term for “decorated truck,” is a phenomenon I’d never heard of until a few weeks ago. I don’t even remember how I stumbled across these trucks online, but I was instantly amazed. Here in the US, we think adding chrome and a few hundred lights makes a truck unique. I’d say we’re still right, but the Japanese have got us beat! Don’t believe it? 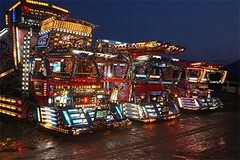 Here’s a photo of your average Dekotora truck. It looks like a Transformer that got stuck halfway through transforming! Granted, the DOT would you-know-what a brick if any of us tried to add this much stuff to our trucks. I’d also love to know – do they not have weight limits there? Some of these trucks are completely hidden under all of the extra rigging, and that stuff has to add hundreds if not thousands of pounds! You might have seen a couple of these trucks in the Honda Civic “ninja” commercial. Obviously, we see a lot of trucks around here. Unfortunately, not all of them are swans. A lot of them are still going through that ugly duckling phase, and some of them might never get out of it. But, we also see trucks every day that are gorgeous! Sometimes the deciding factor is lighting, sometimes it’s chrome, sometimes it might just be a clean paint job. From working with folks for almost 10 years to beautify their rides, we’ve learned some of the traits these pretty trucks have in common. So take note – these secrets can make the difference between a 1st place truck and a “participation” ribbon. Plan ahead – While it’s not required, a lot of the best looking trucks have a clear theme or idea that they’re built around. Think of the Gambler or Pirates of the Caribbean. Those fan favorites are all driven by a central theme. It doesn’t have to be elaborate. Your theme might be “spikes” or “purple.” But it’s easier to choose parts when you have an overall vision. Another example is our Peterbilt 379, which has a subtle Egyptian theme. Our custom Sphinx hood ornament and the hieroglyphic-print upholstery anchor that idea! Granted, the ancient Egyptians didn’t have spinners, but some things just have to be overlooked. Study others – Learn from other trucks’ mistakes. Next time you’re at the truck stop (or even better, at MATS or GATS), walk around the lot a bit and see what trucks look good to you and make a list of some of the qualities they have in common. Don’t rip off someone’s idea, though – nobody likes a copycat! Keep an eye on that calendar – If you want to show your truck, don’t wait until the last minute to order parts! Every year, about 10 days before the MATS, we have people calling in desperate need of some obscure part that it will take us a full 10 days to get to them. One of my junior high teachers used to always say before a test, “If you don’t know it by now…” The unsaid portion being, “it’s too late!” Don’t stress yourself out by waiting until the last minute to get parts! Your goal should be to have that as truck ready to go as possible at least a week before the show. Maintain your truck – Don’t put off regular truck maintenance in favor of buying chrome. We’ve worked on so many trucks that had oil leaks, bad tires, and who-knows-what-else wrong with them that just needed some TLC. In the long run, it will save you money – which means a bigger chrome budget! Self-control – This echoes back to our first secret. Don’t just pick up parts because they look cool. Sit down and look at your truck and decide where you want to hang chrome and where you don’t. A lot of our customers like to make lists so they don’t go on a mad spending spree when they come to the chrome shop. Some trucks look fine completely covered in stainless, others don’t. The difference is planning! See, that’s not so tough! Keep these secrets in mind and you’ll notice the difference in your truck. Since you’ve already seen all the great chrome from our project with Mr. Shmuel Valency, instead of re-capping all of those parts again I thought this time I’d give you guys a little behind-the-scenes trivia about the video shoot. First off, all of our video scripts are generally written by Dennis beforehand. There is a little bit of improvisation and sometimes things are rewritten so they can be put into cleaner shots. All of these videos are shot, directed, edited, and produced by yours truly, Webmaster Lenae. I came up with the title, “Witness the Birth of Beauty” because I always see horror movies using “Witness the Birth of Fear” even though it’s already been used by like 400 other movies and none of them are that much scarier than the others. BUT, I’ve never seen anyone refer to something as the “birth of beauty,” so I thought this was a neat title. We shot this in the evening so you would be able to see the lights. Unfortunately, we don’t have “movie” lighting so the drawback is that it’s hard to see Dennis and Michael. The “chrome baby” line tripped them up a few times. I have some outtakes of them giggling (yes, they are prone to man-giggles) that I probably ought to cut together sometime. You can also hear the lovely Arkansas bugs in the background. It took us awhile to figure out background noise in these videos. For example, in this one you’ll hear the air conditioning units. To us, that’s noise that’s always there so we tune it out. But later, when I was editing, it sounded HORRIBLE! Sour gummy candies of ANY KIND are a favorite snack of Michael and Lenae, both. If you ever need to get on our good sides, bring us sour gummy Lifesavers or worms. Sour Patch Kids are also acceptable. We will eat them until our tongues bleed. All in all, this was a fun video to shoot. We came thisclose to running out of light completely, but I think it was worth it to show off the lights on this great truck. It’s that time again – time to step back into the past and remind ourselves of the great work we did on Mr. Shmuel Valency’s Kenworth W900L. We really have some great memories of working on this truck! Let’s get right down to it. This is just one option you have for mirrors. We have all of the components you need to create a custom mirror setup, whatever meets your needs. The LED lights in this license plate frame were a perfect accent to the lighted “Valency” cutout in the chrome bumper. You just can’t ever get enough chrome on the Daylite Door. This window trim is just a great compliment to the upper window trim that we also installed on this truck. These door handle trims were originally designed for Peterbilt trucks, but all it takes is just a small adjustment to fit them onto a Kenworth. If the extra LED just isn’t your thing, we also carry these door handles in a plain style. The cab lights shown in this video are an addition to the ones previously spotlighted in webisode 5. We loved the way these lights looked going up the sleeper wing, so we continued the look all the way up to the sleeper cap. Some great collaboration from everyone on the team! Like Dennis says, tune in next time, to Chrome Time. And in the meantime, don’t drive an ugly truck! In Chrome Time episode 3, we explored some of the bigger, more expensive pieces we installed on Shmuel Valency’s Kenworth W900L. For some drivers, these parts are a necessity, and they’ll go broke if they have to! For others, the possibility of damage isn’t worth the risk. Whichever camp you belong to, we’re sure you can still appreciate the beauty of these stainless steel fenders, light bars, and LED lights. This stainless steel rear T-bar is a great alternative to having three separate pieces on the back end of your frame. It replaces the two mudflap hangers and the rear center light panel, resulting in a sleek, polished rear end. Different light configurations are also available. We don’t keep the ribbed version of these fenders in stock, as seen in the video, but we sell plenty of the classic smooth style. All fenders can be tricky to install, so it’s critical to do your research prior to investing in any set of fenders – stainless steel, fiberglass, or aluminum. Like the fenders above, a rear frame cover can also be extremely tricky to install. For most trucks, we prefer to have them custom built by Roadworks instead of attempting to modify a stock frame cover for each truck. Sometimes, a measurement will be off by less than a half inch, but that can still throw the entire project off. 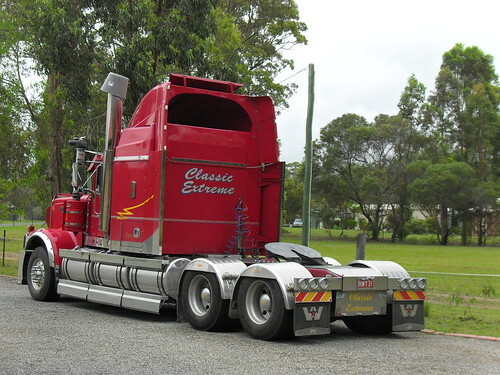 Mr. Valency’s rear frame cover was custom-built, so we’ve used a Freightliner Classic cover for an example here. Again, these rear sleeper bars were a special order. However, they don’t have to be custom made, we just didn’t have room to keep them in stock at the time! The pricing between Peterbilt and Kenworth is fairly similar. You can also have different light configurations made up. As you can tell, we really enjoyed working on this truck. It’s not often that we get to chrome a truck when it’s brand-new and untouched, and Michael and Mr. Valency really did a great job creating and executing a creative vision. In Chrome Time episode 2, we took some time to tease Michael about his Wolverine beard, but more importantly, we had added a lot of new parts to Shmuel Valency’s Kenworth W900L. 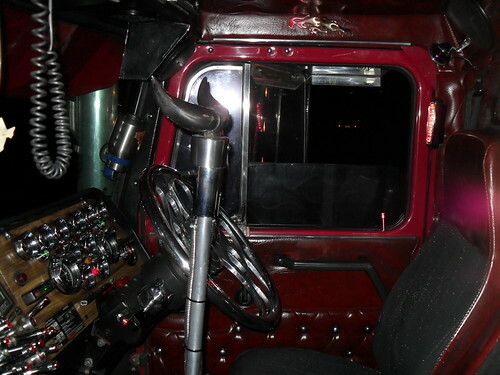 This time, we still focused partially on the LED lights, but we also shared some of the stainless steel trims and panels that were added to the truck. A few products, like the stainless steel wing extension Dennis starts the video with, are special order for now. Call us anytime at 870-735-5033 or toll-free (US only) 877-735-5033 to order anything we don’t keep in regular stock. 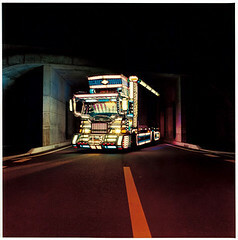 Every truck needs a cab and sleeper kit, or chicken lights, as some people would say. Maybe lights aren’t your thing, but you at least need the stainless steel panels to really add some great sparkle to your truck. The long, solid line gives the illusion that your sleeper is longer than it really is. Once again, we chose a Maxxima light for this project. Maxxima is one of the most trusted brands in truck lighting, so it made sense to use their lights for such a high-profile task. These millennium style marker lights have been one of our favorite lights for many years. The curvy lens creates just enough drama to intrigue other drivers into taking a second look at your truck. As we’ve said before, we like for lights to look good and add to the truck, even when they’re off. This light definitely pulls its own weight. A great compliment to the square turn signals on the fenders, these 4″ round lights were an obvious choice for the mirror turn signals. These door handle inserts say that they’re for Peterbilt only, but with a little ingenuity and small customizations, they will fit on Kenworth trucks as well. The blue LED glow was a recurring theme that Mr. Valency really enjoyed on this truck. If you recall, we also achieved a blue glow with the air cleaner cans in Chrome Time Webisode 1.